Chronoscope 2 uses mapbox gl, while Chronoscope 1 was built with google maps. Internally, the same routines are used to calculate and position the map for the XML ChronoAtlas project and for Chronoscope World. The ChronoLink sharing feature has been enhanced to point to a Leibniz Map as well. [√] L10N bugfix for important buildings. Link to GeoPortal Hamburg. Depending on the chrono year the map (Vermessungskarte) of either 1880-89, 1900-10, 1930-40, or 1990-2000 are selected. a location based Chronoscope: jump to user's location! [iOS 11, iOS12] Zooming the map with pinch&spread gesture zooms the entire view. [Safari] link to google Streetview does not work for Safari. Chrome and Firefox are ok.
"Undo home zoom" is not 100% robust. Sometimes another place is still stored. Optimized WebApp not supportet at the moment due to year links, that exit the app and jump to Safari. A map from 1867 has been rectified and added to the Chronoscope. User can switch between 3 maps. Shall it be called a minimal viable product (MVP)? Anyway – you can travel around Hamburg and trave through time. 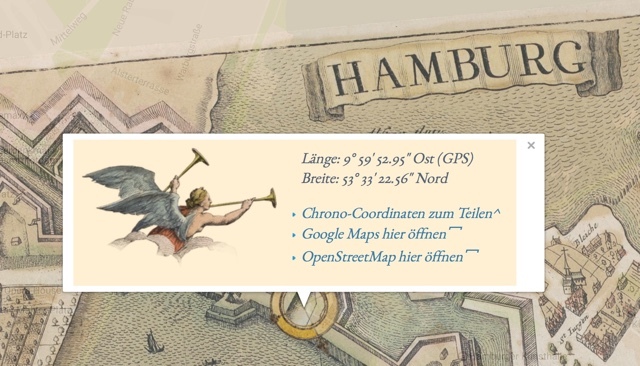 Please provide feedback to improve the Chronoscope Hamburg. [v1.x] Initial loading might be slow as the maps need to be cached in one step. A progress indicator is missing as well, as asynchronous loading cannot be tracked at the moment. [Feb 2017] The location of the Sternschanze in the map of 1694 is not quite correct. Re-rectification of the map seem necessary. Tweet Matthias mprove or get in touch otherwise.